musical palate there will be a tasty treat waiting. For instance if you like brass bands, there are the regular Sunday afternoon concerts on Ross Bandstand. Take a picnic and enjoy the beautiful river surroundings while listening to a great selection of local bands. This year there’s also a spectacular ‘Proms in the Park’ event (20th August). There are plenty of opportunities to hear local choirs …and sing with them!. why not try your hand at bell ringing! (also at St Mary’s). to jangle your spurs along to some blistering country tunes. You may even end up line dancing!. On the same weekend the Linton Blues Festival rocks up, and as always boasts an impressive line up. This year the Sunday night headliners are Texas bluegrass outfit ‘Hayseed Dixie’. It’s just a pity these two great events clash. DJ night and other attractions like fairground rides. What’s more - its FREE. which is new this year, and features plenty of music as well as an open air cinema (showing Grease). is headlined by legends ‘Eddie and the Hotrods’. Another brand new event this year is the ‘Ross Busking Festival’ (9th September). towns streets with all manner of live music, and hopes to be a regular feature which will encourage young talent. an ‘Open Mic’ night on Tuesdays, giving a great opportunity for budding musicians to get stage time. so dust off your ears and do some soundbathing this summer. Linton Village Hall is a great place to see music. have been removed, and a stage installed at one end). it looks full and can generate a great atmosphere. smokin' feet after you’ve got down and shaken your funky thang. The night we were there (24th Feb 2017), we saw ‘Malpractice and the Sick Notes’. A six piece covers band who include 5 ex GP’s in the line up. This review is actually about the venue rather than the band, so the fact that they didn't float my boat should not, and does not matter. There were plenty of others in the room who were launching themselves onto the dance floor and having a great time. from Gypsy Swing, Jazz, Blues, Rock, Electronic and World Music, so if that sounds tasty, this is a must see. Ok, Linton is about 3 miles out of Ross, but the journey is worth it. Just get a designated driver! The Ukulele Man of Ross (Matthew Stead) and the Ross Uke Troupe gave a brilliant charity concert on Saturday night. They raised over £500 for the Evelina Children’s Hospital and entertained a packed Phoenix Theatre, Ross-on-Wye. The first half of the show featured the ‘Ross Uke Troop’, formed from ukulele students of all ages, all taught by Matthew. They attacked their repertoire of pop covers and classical arrangements with gusto and clearly had a great time, as did the audience, who clapped, cheered and generally showed their appreciation throughout the night. After the interval Matthew treated us to a virtuoso performance of traditional Hawaiian tunes and Jazz songs, demonstrating why the Ukulele is so keenly loved. He was joined by various guests including 10 year old Bear Dhunnoo Kattan, for a terrific rendition of ‘Somewhere Over The Rainbow’. By the end of the evening the whole audience were singing along to glorious versions of Leonard Cohen’s ‘Alleluia’, and the classic ‘Life Of Brian’ tune ‘Always Look On The Bright Side Of Life’. 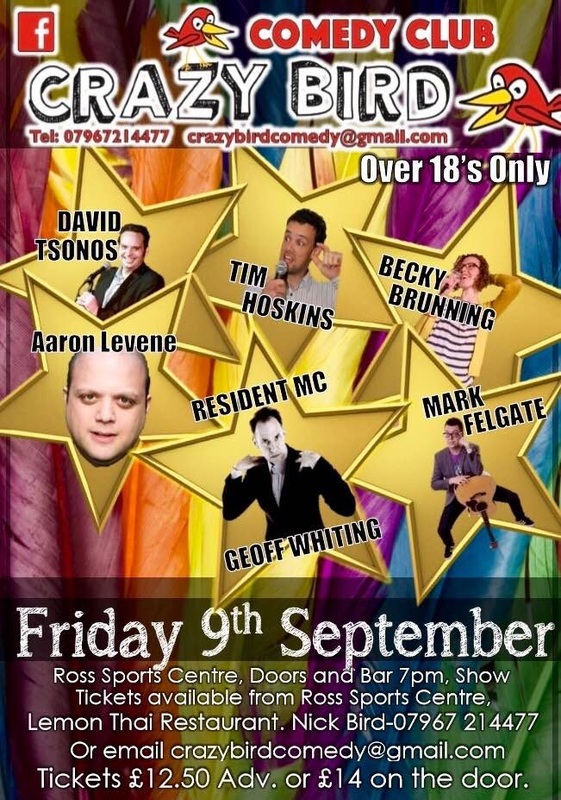 at Walton Sports Centre was organised by Crazy Bird Comedy, who already hold regular comedy nights in Stroud. whipped into a whirlwind of hysterical glee. Everywhere people were laughing out loud and clearly having a great time. Such is the power of a live comedy show. My personal highlight was squeaky voiced Canadian David Tsonos, whose priceless observations on the intelligence of cats, and the logic of countries choosing national animals (…Canada chose the cute little Beaver, while Wales plumped for a fire breathing DRAGON!…) were top drawer. ...and Tim Hoskins, was forced into an encore by an enthusiastic audience who loved him, and his stories about causing work colleagues to fall off ladders or get thrown through plate glass windows. The whole evening was expertly held together by highly experienced compere Geoff Whiting, who grabbed the room by the funny bone from the outset, and didn't let go. Another show is being planned, and judging by the reaction to this one, Crazy Bird Comedy could build a regular nest in Ross, with some cracking good comedy eggs inside.